Mango Bikes was founded with a goal to design, manufacture and sell high quality, simple and stylish bikes and unbeatable value. The team at Mango design and build each and every bike individually to spec. 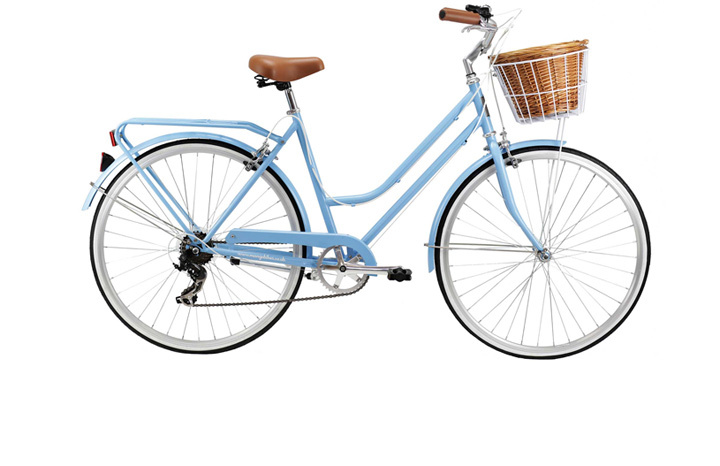 The Ladies Classic is Mango Bikes’ answer to the girl about town looking for style, comfort, simplicity and reliability. Its extra padded saddle, swept back adjustable bars, Shimano gears and a step through frame make it the perfect ladies bike for commuting and weekend cruising. I’m very much what they’d call a novice biker and would look at the spec of the zillion different types of cycles available on the market without an interest and knowledge that was bordering on the non-existent. So I was absolutely delighted when I found a bicycle that I instantly knew I loved just by looking at it. It was a vain kind of attraction I got to the classic and super-suave design of a Mango Ladies Bicycle, but a charm that wasn’t short-lasting nor poorly founded. Unlike the generally boyish, rough and ready mountain and road bikes that line the cycle shop windows, this bike is a real lady. It’s the Doris Day of the cycle world- elegant, feminine and gets noticed for all the right reasons (so much so that my usual route around the local lake took a fair while longer as I ended up chatting to strangers who wanted to admire my pretty new wheels). And this bicycle is indeed seemingly taken straight from that Doris Day kind of era, taking you back to summer holidays in the sun on your old Pashley, meeting y friends or a new beau behind the bike shed sometime around 1959. It’s a classic bicycle every woman who’s watched too many films and read too many novels would daydream about, complete with pastel coloured design (there’s five beautiful colours to pick from), a trusty wicker basket and a bell. It might be twee but it’s such a thrill to ride on, especially on a warm summer evenings in the countryside. Contrary to what you might expect from such a pretty little thing, it is practical too. With seven speed Shimano gears, a sturdy frame and a surprisingly pain-free seat, it certainly does the job of getting you from A to B comfortably, safely and quickly. The step-through frame also means there’s no un-lady-like leg cocking required to get you on and off (always a blessing on the days where you picked to wear a skirt). It’s worth saying that this Mango Ladies Bike is definitely a city girl in that her natural habitat is smooth tarmac and wide open roads that she’ll speed over a dream. She’ll take hills and slightly bumpy country roads without a fuss too, but she does tend to make quite a commotion (expect a fair bit of disconcerting clanging noises) on rubbly roads or really uneven surfaces- so best leaving those kinds of terrains to the big gun mountain bikes. She does need a little extra tender loving care than more sturdy models as well to keep her in pristine shape so it’s perhaps not the right bike for you if you’re after something you can chuck in your garage and lumber around the town without too much thought. Overall, the Mango Ladies Bike is a real showstopper that really stands out (and deservedly so) from the crowd. Stylish, smooth and proven to be not just a pretty face.